The “Garrote” (Spanish. Garrote, dar garrote – wrenching, tightening, execution). 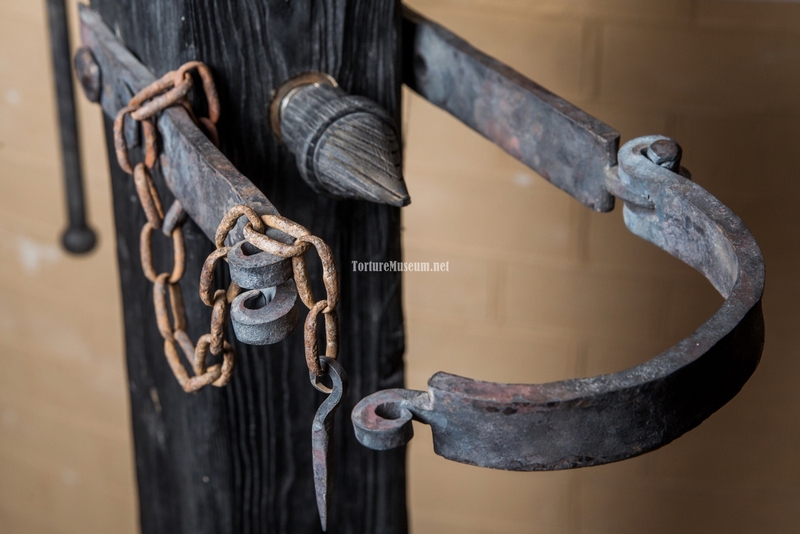 A Spanish method of punishment and torture. Employed as the following types of torture: “the nobleman Garrote” involved saddling the condemned man on a horse to the place of his execution, and he was able to give the signal for his execution; the “common garrote”, meant arrival on horse or mule; “vile garrote”, the prison enters either on a donkey, or by foot. 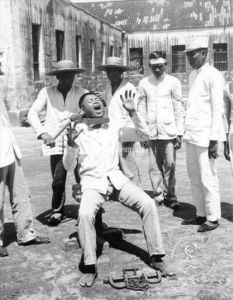 The term “vile garrote” also came turned up in Spain as a common name for this form of punishment. 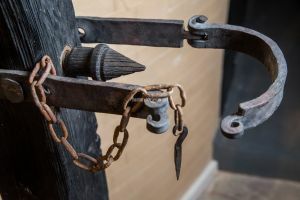 The most famous variant of the garrote was a chair with ropes and rings, with locks for the wrists, forearms, waist and legs of the dead-man. 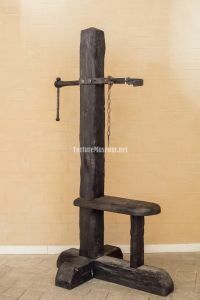 The backrest was made up of a wooden pole with a collar to shackle the prisoner’s neck, as well as a bolt rotated with the help of lateral hand-wheels. The bolt’s end was usually a razor blade or a small spike in the shape of a star. When the executioner tightened, the spikes dug into the man’s neck, broke his spinal cord, pushing the spine through the brain. These improved garrotes accelerated death, no longer needing to sacrifice hours on asphyxiation. However, the bolt often misfired, going through the neck without touching the spine, causing the offender terrible pain which often wasn’t lethal. 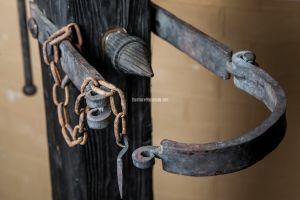 An interesting fact: In Spain, the garrote was used as a punishment for various crimes until 1974. That particular victim of the Franco regime was Salvador Puig Antich, whose death provoked an unprecedented response within society and forced Franco to abolish the cruel penalty. The last country to do away with the garrote was Andorra, beginning in 1990. Would you like you know how some judges interpret the ‘humane treatment’ of people? This can be well-demonstrated by the example of the garrote. That is how the condemned here are being delivered to a humane end. A man is seated on a chair, tied in such a way so that his back remains upright. Do you see the straight, vertical bar behind the chair that has been leaned against the nape of the condemned man’s neck? Within this bar there is a hole drilled at the neck-level of a standard-sized person. For those who are not so tall, it has to be placed against the front of the skull, high, in front of the clavicular depression. If in this instance something can still be positioned under the seat in order to bring the neck to the level of the hole, then in the case of the second variant of adjustments it is better not to undertake such a maneuver. The prisoner’s neck is fixed in place by tight leather straps. The most important detail of the garrote — a spiral screw with handles for two hands, which is inserted into the bar. The torturer grabs hold of the handles and begins rotating the screws. With each consecutive turnover the metal sting is is brought closer and closer to the hole’s outlet, and when man is enveloped in horror as its cold touch caresses his neck, it is violently shoved forward and he begins to choke. The hands of executioner ruthlessly rotate the screw and thus, in the end, he penetrates the skin. Then, with a nasty crunch, he crushes the cervical vertebrae and breaks the spinal cord. It is believed that this process paralyzes the victim, releasing him from the torturous agony. What is humane about this, you ask? The fact that the executioner merely suffocates the sentenced man while his eyes have not yet been popped out of their sockets.